Upon arrival, a member of our staff will meet you at Queen Alia International Airport for assistance with customs and immigration procedures. A private transfer to your selected hotel in Amman. Dinner and overnight at the hotel. Following breakfast, your sightseeing begins with a visit to the village of Ajlun with its fortress and magnificent view into the Jordan Valley. Next, proceed to see the amazing ruins at Jerash, one of the best-preserved Graeco-Roman cities in the Middle East. In the afternoon visit Um Qais, a city rich with basalt ruins and overlooking the Jordan Valley, Golan Heights and Lake Tiberius (the Sea of Galilee). Return to Amman for an evening at leisure. Breakfast at a local restaurant in downtown Amman as everyday Jordanians do. In Amman, you can visit ‘The Winemaker’, which is a boutique wine tasting shop where you can taste and purchase locally produced, international award winning wines. If you are lucky, you will meet Jordan’s leading wine maker in person, who will tell you about the delicate considerations and challenges of producing wines in this region. This morning’s city tour of Amman, Jordan’s capital begins at the Citadel, followed by stops at the Roman Theatre and Umayyad Palace. There will be free time for walking and shopping in the old section of the city. Afterwards, leave the city and drive to spend the afternoon at the Dead Sea. Here at the lowest point on the surface of the earth enjoy an exhilarating swim in its warm salty waters. Return to the city for an evening at leisure to explore Amman on your own. A walk in one of the oldest middle class suburbs of Amman and a short coffee break at the Nature Centre where clients can enjoy a magnificent view of down town Amman. Continue for lunch at Fakhr el Din, a unique turn of the century house that was converted into one of Jordan's top restaurants. Departure to the Dead Sea. Indulge in one of the many available therapies at the resorts luxurious spas. Travel south today along the King's Way, an ancient route that was used by traders, armies and pilgrims centuries ago. Stop in the Christian town of Madaba "The City of Mosaics" and then take continue on to Mount Nebo, the site where the Prophet Moses was thought to have glimpsed the ‘Promised Land’. See the monastery, possibly the burial site of Moses. Proceed to Kerak through Wadi Mujib, a deep valley with breathtaking views. In Kerak, visit the castle built by the Crusaders. 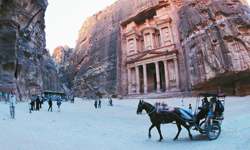 Arrive at the end of the day in Petra for a 2-night stay. After breakfast travel to Beida, also known as ‘Little Petra’, one of the oldest habitations in the Middle East where pre-Neolithic pottery has been found. Continue south to the enchanting Wadi Rum, where pink, sandstone cliffs rise up out of the desert. Take a jeep tour through the Wadi to watch the sunset view with a stop to drink a cup of traditional Bedouin tea. Arrive in the evening in the Gulf city of Aqaba. Arrival to the sunset area in Wadi Rum after the jeep tour. Enjoy a glass of champagne while watching the most magnificent view inside the Wadi. After the jeep tour drop off at a Bedouin camp inside the desert for a private traditional Bedouin dinner party with live local music. Breakfast. Free day at leisure in Aqaba. Those interested in snorkelling can enjoy the sport at one of the world’s best conserved coral reefs. Late afternoon transfer back to Amman. Dinner and overnight at the hotel. 2- Cruise in a Private Yacht with Lunch. Relax at the Turkish bath in Amman where your limbs will be wrestled "with apparent violence, but with such skill that an untoward accident in this operation is never heard of" The pleasures of a Turkish massage, to quote EW Lane! Dinner at the bath house. After breakfast, check-out and transfer to the airport. Assistance with check-in formalities for your onward flight.